To study the inﬂuence of dispersed solid particles on the heat transfer in shear ﬂows, we consider a laminar shear ﬂow (plane Couette ﬂow) between to parallel (nonslip) walls moving in opposite directions with the same speed. The walls are kept at ﬁxed (and diﬀerent) temperatures while the domain is double periodic in the plane parallel to the walls. A spheroidal particle of diﬀerent heat diﬀusivity than the base ﬂuid is placed in the middle of the Couette ﬂow. Because of the shear, the particle is a subject of rotation, which enhances the ﬂuid mixing and inﬂuences the heat transfer properties of the suspension. 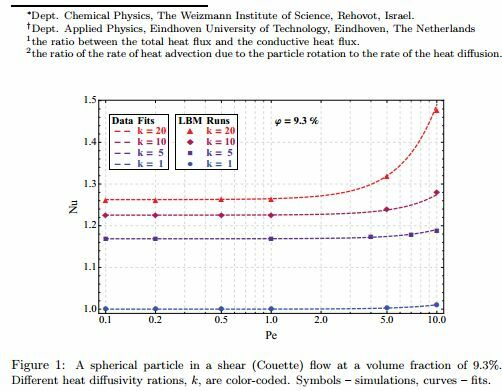 The numerical simulation of the conjugated heat transfer problem are performed by means of two coupled D3Q19 Lattice-Boltzmann equations under the BGK approximation for velocity and temperature ﬁelds and MolecularDynamics simulations for the particles motion. The results of the simulations are benchmarked against known analytical solutions for simple shear creeping ﬂow and for conjugated heat transfer in quiescent ﬂuids. We ﬁnd evidences for heat transfer enhancement due to the particles’ rotation in the shear ﬂow. The dependence of the Nusselt number1 , Nu, on the Peclet number2 , Pe, at diﬀerent particles’ volume fractions, heat diﬀusivity ratios and particle aspect ratios is studied. An example is presented in Fig. 1.